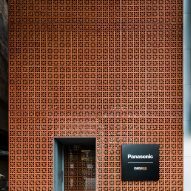 Light filters gently through the perforated terracotta facade of this showroom for electronics company Panasonic, designed by Vo Trong Nghia Architects for the Vietnamese capital Hanoi. Panasonic and its distributor Nanoco asked Vo Trong Nghia's Vietnam-based firm to create a showroom and gallery where they could exhibit their lighting products for architects and designers. 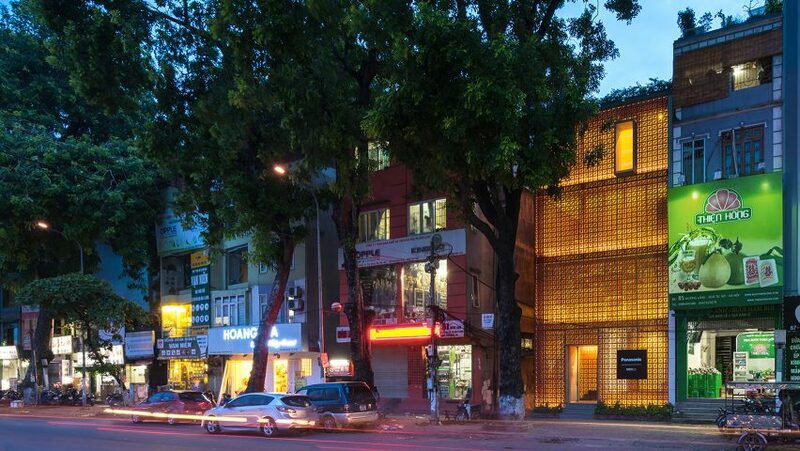 Called The Lantern, the four-storey-high building occupies a 72-square-metre plot in Hanoi's Dong Da district. 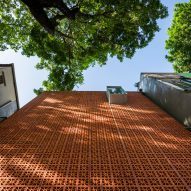 To help the building stand out from the busy streetscape, as well as a row of trees in front, the architects gave it a decorative facade, using terracotta blocks with flower-shaped perforations. These blocks allow light to seep in gently. In daylight, they also form a canvas for different shadow patterns cast by tree foliage, while by night they allow the building to glow. "The foliage overshadows the site, making it difficult for pedestrians to recognise the building from the main road," said the team. "This building provides a delicate backdrop to the ever-changing tree." "During the day shadows are cast upon the clean facade, bringing it to life," they continued. "In the evening, the building is illuminated from within, acting as a lantern in the city." A steel and glass structure is set behind the perforated facade. There is also a large void in the southern corner of the building, which ensures that daylight reaches the rear of all four floors, as well as the basement. A staircase with wooden treads and an slender handrail occupies this space. The showroom is arranged around this stairwell on the three lowest levels, allowing visitors to view products while walking up and down the steps. A meeting room and a simulation space occupies the second floor, while a gallery is located on the uppermost storey. This gallery features a skylight that reveals a roof garden. There is also a concrete window seat that cuts into the perforated facade to let visitors perch and view the streetscape below. Vietnamese architect Vo Trong Nghia is establishing himself as Vietnam's most prolific 21st century architect – ranking 28th in Dezeen Hot List, a comprehensive guide to the most newsworthy and searched-for players in the design world. 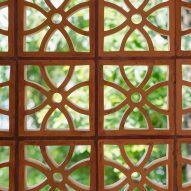 The architect has become particularly well known his for pioneering use of sustainable materials including bamboo and thatch. Earlier this year, his firm completed a house in Nha Trang with topped by stepped garden. Photography is by Hiroyuki Oki and Trieu Chien.